Our ANC Commissioner stated that there would be a meeting two weeks after the ANC Meeting to address traffic. I have not heard anything on that meeting (not surprised) so I will step up and get this information to the proper individuals at DDOT. The RED represents a bridge that would cross over the South Dakota Avenue exit and ramp onto either 50 East or 50 West. The GREEN represents drivers turning left from Market Street onto Fort Lincoln Drive. Turning the Fort Lincoln Drive exit to a 2-direction street and having cars get back on to South Dakota Ave. and connect with the Yellow option. These are just ideas, what are your thoughts? The RED would be perfect but a much bigger problem for the neighborhood. Rush hour traffic leaving the city would overwhelm our neighborhood. People would do anything to find a “shortcut” out of the city through our neighborhood. I think the YELLOW option was brought up during the ANC meeting and the one of the gentlemen (can’t remember his name) said that DDOT wouldn’t allow it. The only sensible option and in my opinion, doable, to relieve “some” of the traffic is the GREEN. The red is intended to be a one way exit ramp from the Shops back to route 50. I think this will work with ride redesign to both the shops and route 50. 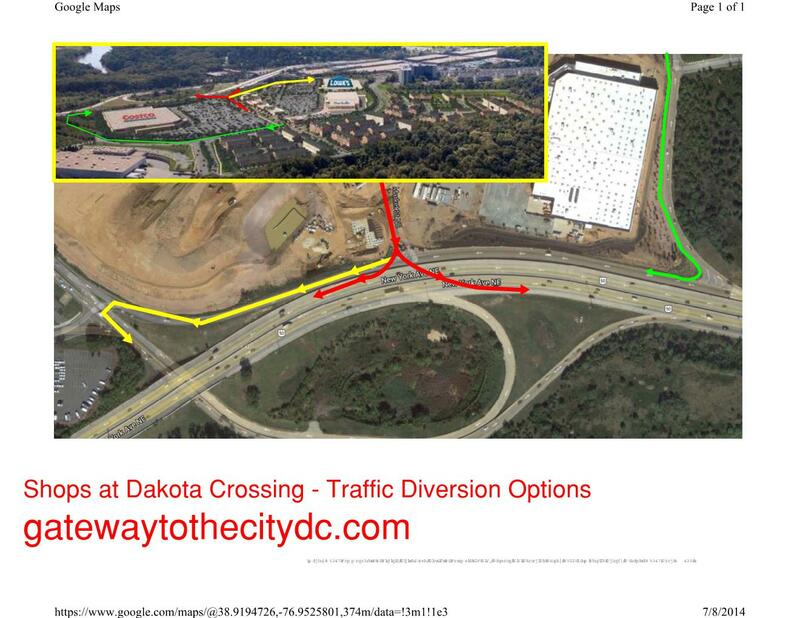 If the red is added as is it will Create congestion adding additional lanes to accept that traffic could relieve it. This is used at other retail centers in the area. Also I am reaching out to some non-profits interested in performing a study and traffic options. I am interested to know if there was any response regarding this issue. I would love the red option however, I too, am concerned that cheaters would come down ft. Lincoln and enter into the shopping complex just to avoid the So. Dakota traffic. Ft.Lincoln and 33rd place are currently being used as a “short cut” and create congestion. Either way traffic congestion will be a real issue once the shops are completely finished. The reality is that the entire street scape needs to be redone. Using thelogic that the shops will become a short cut, just means that nothing can be done. I am reaching out to people smarter than myself who specialize in traffic engineering, to help with solutions.